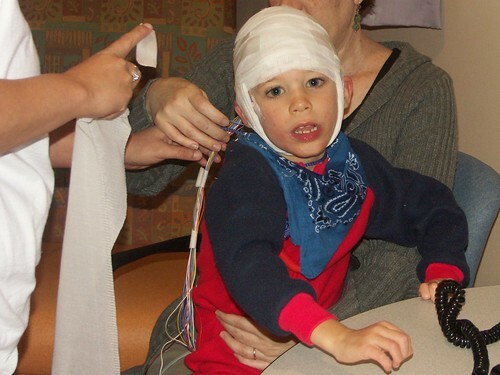 Joshua had a video EEG done last week to test for seizure activity. We were at the hospital for about 30 VERY long hours! Don't ever go to a hospital to get any rest, it's impossible. Anyhow, it did go well, they were able to see the seizure activity that I had witnessed a month or so ago. While it was scary to witness again, I was so glad that it happened, so that they could see it for themselves and know that I really did see what I thought I had. I would hate for Josh to not have had any activity while we were there and then have it happen again a week later and have to do the testing all over again. He did not have any seizures unless they used a strobe light to induce them, and they tested the frequencies that it occurred and used different colored filters in front of the strobe to see what difference that made. He seized at many frequencies and with all colors but blue. From that they were able to tell that he has photosensitive epilepsy. He has an appointment on the 11th to see a pediatric opthamologist to get his vision checked and to get a prescription for frames with polarized blue lenses in them. The blue lenses are supposed to keep him from seizing when he normally would with certain light conditions. He had two seizures today on the train at the zoo. We were on the train, it was going through the trees, and the sunlight streaming in through the trees and flickering, set him into a seizure. He bumped his head when he first went into it because it makes him stiffen his entire body, so he sort of goes from the sitting position to a stiff board for the duration of it. He was wearing sunglasses, but not the right blue tinted kind. The eye doctor appointment can't come fast enough for me! He had a blast on the train other than that, and loved riding the carousel also. We had a great zoo day, the weather was just gorgeous for it, and the animals were quite lively. The lions, tigers, and giraffes all have babies running around right now, and they are so cute! I have so much more that I need to update here, but for tonight I am exhausted!